National Australia Bank (NAB), who own the Yorkshire Bank, announced yesterday that they are closing dozens of local branches, including the one at Hebden Bridge. The busy Hebden Bridge branch is ideally situated in the very centre of Hebden Bridge, next to the former Tourist Information Centre. It will close from 24th August. Today's Yorkshire Post reports that business leaders are outraged, warning that some of the county's communities could become ghost towns. 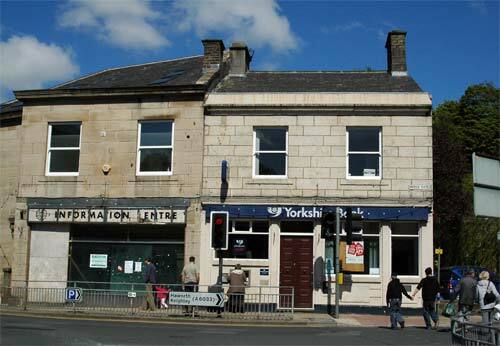 "I am very concerned that Hebden Bridge is to lose their branch of the Yorkshire Bank. When job losses were announced back in March, the bank stated that they would minimise cuts in front line staff - now it looks as if they are going back on that pledge. "They may be named the Yorkshire bank, but it is obvious that their management is very distant from their historical roots. This looks like asset-stripping of the worst kind. It seems particularly insensitive to slip these proposals into an announcement that the banking group which includes Yorkshire Bank earned more than £100 million pounds in the last six months. "I will be seeking an urgent explanation from the Bank about their justification for this closure, and demanding to know what plans are being put in place to ensure customers a satisfactory service in the future. "In addition, I will be looking for answers about their future plans. They have not announced the full list of branch closures, admitting that more are to come over the next eighteen months, and I will be asking for assurances about the future of the Brighouse, Todmorden and Elland branches. "I will also be looking to meet with the trade union, Amicus, to hear their concerns about how staff are being treated and to find out what alternatives they have asked the Bank to consider." National Australia Bank (NAB), Yorkshire Bank's owner, said the closures were a response to changing customer behaviour – such as the growth in Internet banking – and would allow it to invest more in its remaining branches.